Most raw plastic material looks dry. However, everything is not always what it seems. Hygroscopic materials such as Polycarbonate, Nylon and PET to name just three, attract moisture from the surrounding air. So, although it is manufactured “dry” by the time it gets to the processor it will have some moisture content. During processing a chemical reaction (hydrolysis) takes place making the long polymer chains shorter. Long polymer chains are required to make good product. Short chains result in poor quality mouldings. Attempt to process raw materials that have moisture content and you could find a number of ultimately expensive issues, such as product quality in terms of strength and appearance. It should also be taken into account that over-drying of material, for too long or at too higher temperatures is also potentially disastrous. If colour pigments are being used over drying and too long residence time in the drying process can cause shifts in the colour, potentially causing it to darken. So what are the options available to plastics processors to ensure that their raw material is in the optimum condition for processing? Dehumidifying Dryers are designed to eliminate moisture in the plastic material before processing. Air is forced through a desiccant bed to make it extremely dry. This air is then heated to a specified temperature and fed into a Drying Hopper containing the material to be dried. This hot dry air draws the moisture out of the material; the saturated air is then fed out of the Drying Hopper and back through the desiccant bed again to remove the moisture before the cycle begins again. This desiccant has a limited ability to hold moisture before it needs to be regenerated (dried out). Typically, plastics processors use regenerative or twin tower dryers and in this case, when the desiccant bed has reached its moisture retaining capacity the airflow is automatically switched to the second desiccant bed to allow the drying process to continue. At the same time, the first desiccant bed is regenerated by heating to remove moisture, allowed to cool and it is then ready to absorb moisture again. Rotary Wheel Dryers have been designed to address energy and other revenue draining issues presented by other types of drying. Rotor Dryers have a constant dew point whereas in twin desiccant dryers the dew point starts very low but increases as the desiccant bed saturates. When the airflow is switched to the second desiccant bed the dew point starts low again. Dew point control is a design feature of Rotor Dryers which allows the user to select a dew point suitable for the material to be processed and maintain this. This is a particularly beneficial feature as it virtually eliminates over drying. Some models of Rotor Dryers can save up to 40% in energy consumption when compared with the most efficient twin desiccant dryers, due to a lower regeneration temperature. This figure depends on the manufacturer of the dryer and can be less when only a 3-stage circuit technology is part of the design. 4 stage technology is available. Rotor Dryers utilise a rotating wheel which continuously puts dry desiccant into service due to its ability to regenerate moisture saturated desiccant in the same rotational cycle. Whereas the desiccant bed used in traditional Dehumidifying Dryers comprises desiccant beads and clay binder which degrades, Rotary Wheel Dryers employ in the region of 3 times the amount of pure desiccant. 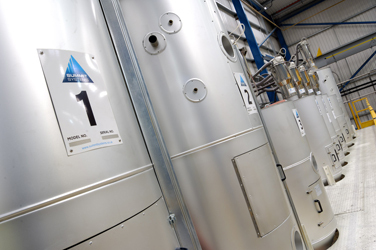 Desiccant beds on twin tower Dehumidifying Dryers regenerate at 320c, however in the Rotor Dryer it is an energy saving 140c. They do not use chilled water and they do not require compressed air. Low Pressure Dryers or Vacuum Dryers accelerate the plastic material drying process by using a vacuum to lower the boiling point of water from 100 °C to 56 °C. The moisture is rapidly extracted from the heated material. Leaving it in a condition to be moulded or extruded. Typically, these Low Pressure Dryers will dry materials in one-sixth of the time required by a desiccant dryer and the use of vacuum provides many process and revenue benefits when compared with conventional drying methods. This method of drying does not use desiccant at all and as such not only saves the expense but also saves the time required to maintain and replace desiccant. 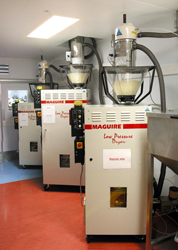 The low drying times offered by these machines reduces the risk of material degradation from exposing material to prolonged elevated drying times. Compressed Air Dryers, compact and light in weight these Dryers are designed to fit to the throat of the processing machine, although a free standing frame can be employed. 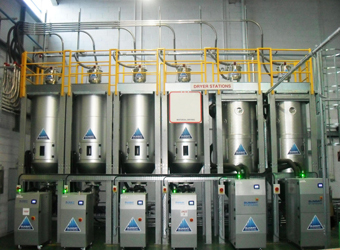 Generally a method of drying employed for smaller throughput machines, the Compressed Air Dryer is similarly equipped with twin desiccant beds as the Dehumidifying Dryer. The main difference between the two is that air flow is generated by compressed air instead of electrically driven mechanical blowers. Hot Air Dryers are designed to remove surface moisture from no-hygroscopic material and to pre-heat material prior to processing. This pre heating is particularly useful in circumstances where material has been stored outside in the cold and is brought into more warm and humid conditions for processing. They usually comprise a well insulated hopper with an attached blower and heater. Hot air is blown through the material granules and the wet air is dispelled into the atmosphere.